Several accidents and serious incidents have highlighted the higher risk associated with conducting functional check flights (FCF). In 2011, the Flight Safety Foundation–led FCF steering team, comprising Airbus, Boeing, Bombardier and Embraer, organized a highly successful symposium to discuss the challenges to be addressed and current best practices for conducting functional check flights. Two hundred and eighty-five attendees from 41 countries attended the symposium in Vancouver. 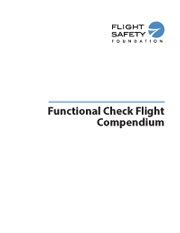 After the symposium, the Foundation and the FCF steering team continued their work and created the Func­tional Check Flight Compendium. This compendium contains information that can be used to reduce the risk of functional check flights. The information contained in the guidance document is generic, and may need to be adjusted to apply to your specific aircraft. If there are questions on any of the information in the compendi­um, contact your manufacturer for further guidance. Our thanks to Airbus, Boeing, Bombardier and Embraer for their valuable contributions to this effort. View the presentations from the 2011 symposium.